A simple campaign with a simple message: "Dude, be nice," is part of a new club at Agoura High School that is encouraging students and teachers to do nice things for one another. AGOURA HILLS, CA -- A simple campaign with a simple message: "Dude, be nice," is part of a new club at a high school in California that is encouraging students and teachers to do nice things for one another. Teachers at Agoura High are answering the "Dude. Be Nice" challenge. There's a compilation of these emotional moments between students and teachers posted to YouTube, featuring everyone from a special education teacher to a football coach. It's emotional when Olivia Robert is recognized by her teacher, Ms. Naberhause. "It's almost indescribable how happy that made me, to see her react and to see her light up," Natalie Naberhouse shared. "Sometimes I think about how tough school is now and how sometimes you could feel so alone and it's just really helpful to have a teacher...," Robert said, struggling to finish her sentence as she held back tears. The challenge is from a club on campus called "Dude. Be Nice," which is run by Eva Anhalt and Haley Marcus. "Our purpose is to promote kindness and to spread happiness on campus," said Anhalt. For the holiday season, the "Dude. Be Nice" club is collecting holiday grams that kids can send to each other throughout the holidays. It's one of many projects they organize throughout the year. When a teacher's husband passed away, the club covered her classroom in hearts from her students. Jason Busby is the club's faculty advisers. So what's the bottom-line message of the club itself? Busby said, "If you're nice to each other, you're going to get it back." "Letting people know that they are appreciated really can mean a lot to them," explained 10th grader Tristan Justus. 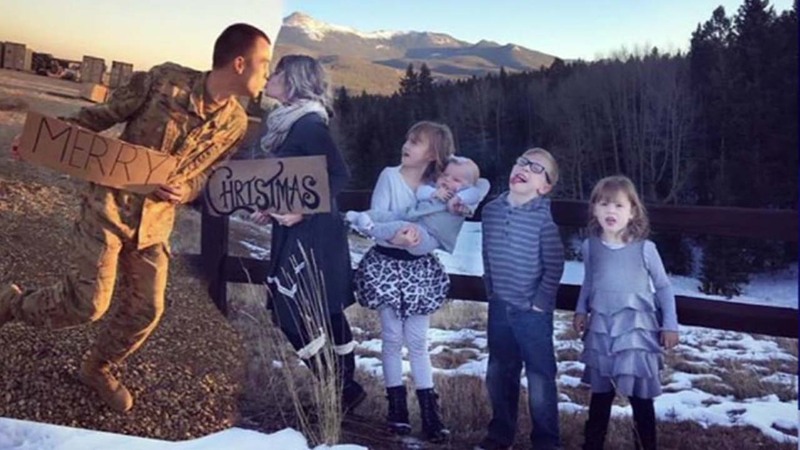 Husband and father of four Brandon Sistrunk won't be home for the holidays this year, but that didn't stop his wife Ashley from making sure they posed for their family Christmas card together.